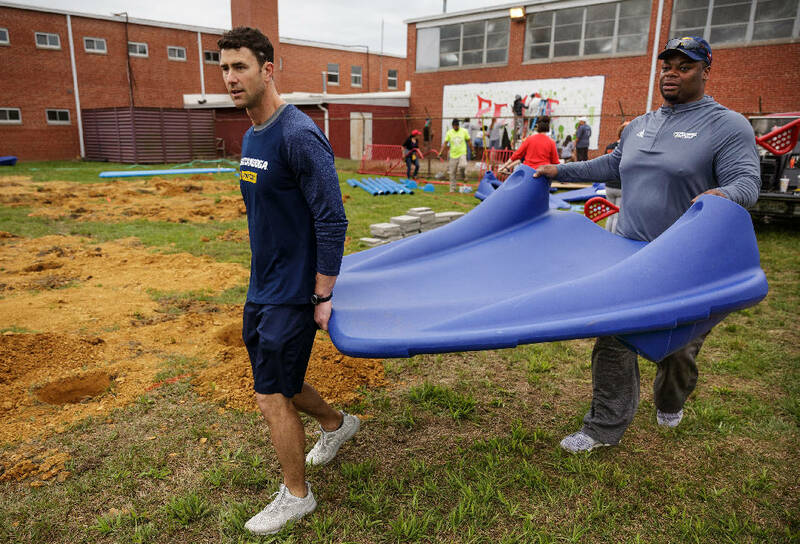 UTC head football coach Tom Arth, left, and defensive line coach Davern Williams carry a piece of equipment during a volunteer day to construct a playground at the Chattanooga Charter School of Excellence lower school on East 23rd Street on Saturday, April 14, 2018, in Chattanooga, Tenn. Volunteers, including University of Tennessee at Chattanooga football players and coaches, helped assemble the new playground equipment over the course of the day. Saturday morning still short of 9:30, University of Tennessee at Chattanooga football coach Tom Arth nevertheless was feeling the effects of some serious manual labor on his 36-year-old body. "I've been carrying a lot of heavy stuff," Arth said with a weary smile. "I don't know what it is, but my forearms are already tired." Arth, his Mocs and a lot of other folks were busy hauling heavy metal parts for state-of-the-art playground equipment on the grounds of the large red brick building at 2029 East 23rd St. That refurbished structure will serve as the new home for the Chattanooga Charter School of Excellence Lower School. "All these volunteers will save us at least $20,000 in labor costs," said Michelle Saunders, the school's assistant director, athletic director and track and field coach. "It's a huge help." All those volunteers encompassed so many more people than the 50 or more UTC players and coaches. The Electric Power Board brought in a large crew. Construction companies from GreenForm, J. Cumby and Ox chipped in. Home Depot and Ace Hardware contributed, too. And when all those volunteers got hungry, nearby restaurants Bojangles, Burger King, Hardee's, Home Slice Pizza, Laughing Sprouts, Papa John's and others all donated food, drinks and assistance. "Being involved in the community is really important to us," Arth said. "We're a part of this community, too. Chattanooga is an incredible city, but a lot of people need our help." So the Mocs worked in shifts, beginning at 9 a.m. Saturday and continuing until close to 3 p.m., doing everything from hauling all the individual pieces for the playground equipment from a storage facility to helping construct the finished product, which should rival any similar playground in the Scenic City. "We want to help our community," said defensive back Kareem Orr, who prepped at Notre Dame before transferring home to UTC from Arizona State. "Something like this makes a difference. It also helps us come together as a team. We're all laughing, having fun. It's a great experience." Not that all of them arrived at the site with much experience in playground building or construction in general, however. "This is definitely not in my wheelhouse," said Mocs tight end Bailey Lenoir, an East Hamilton graduate. "I've mowed lawns, worked in factories, but this is my first time building a playground." Asked his toughest job previously, he swiftly mentioned stacking boxes at a warehouse. "It was hot and you had to wear a hair net," he said. "I didn't last three weeks." Orr wasn't sure he'd last more than a day or two building playgrounds. "I'm glad I did it," he said of his time bolting the metal flooring together for the school's students to walk on throughout the gym set. "But when my shift was up, I didn't want to do it anymore." Yet Arth requires all of his players to perform at least 10 hours of group community service in the spring semester, plus three hours of service work that they come up with on their own. Orr is spending his three hours working with elementary school kids at Orchard Knob. As for Arth, while he professes not to enjoy such heavy lifting — "I struggle to follow an instructional manual," he joked — he actually worked construction for four or five years during his youth in Cleveland, Ohio. "I was once a member of Labor Locals 310 and 860," the former NFL quarterback recalled. "I helped put up all the lighting along Euclid Avenue (one of the most recognizable roads in the northeast Ohio city) one year." That brought a sports writer to ask if Arth could rewire a house. "Uh, no," he said. "I mainly helped with the PVC pipes (for the wiring to run through)." So what was Arth's favorite construction job? "Demolition was a lot of fun," he said with a grin. Maybe all this will help the Mocs demolish opponents this fall, and maybe it won't. Doesn't matter, because it surely will help these student-athletes' perspective on the world around them, as well as being a huge help to the Chattanooga Charter School for Excellence Lower School that Saunders and others so proudly serve. "It's very emotional," she said, her voice pausing as the players and coaches began their shifts. "It warms my heart to see all these people in our community take time out of their busy schedules to help our school." Just call it an instructional manual worth following for how neighbors can help neighbors, no hair net required.